This banjo is based on banjo #46 which I built almost two years ago and even more similar to banjo #100 but with shoes instead of a round flange. 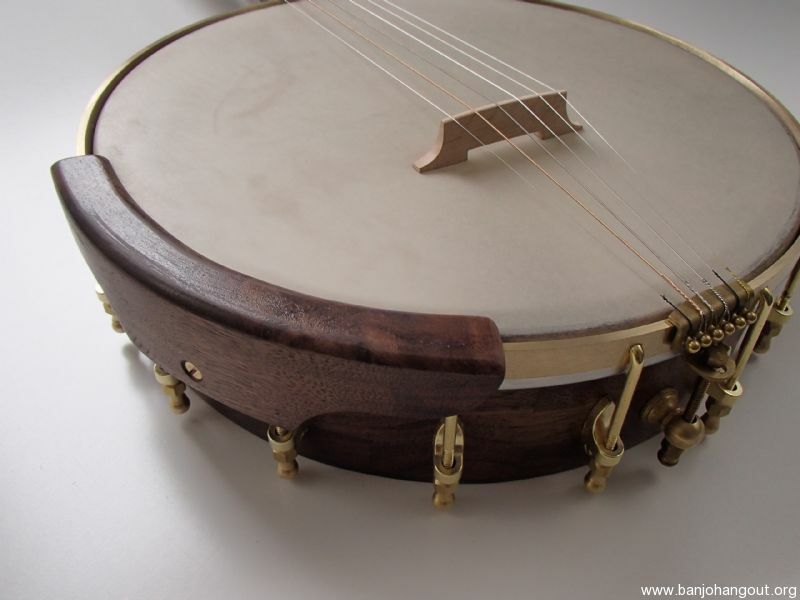 The basic idea is that the banjo can be set up as a 5+1 or “lojo” which is tuned like a standard 5 string but with an extra low G added below the low D in open G tuning. 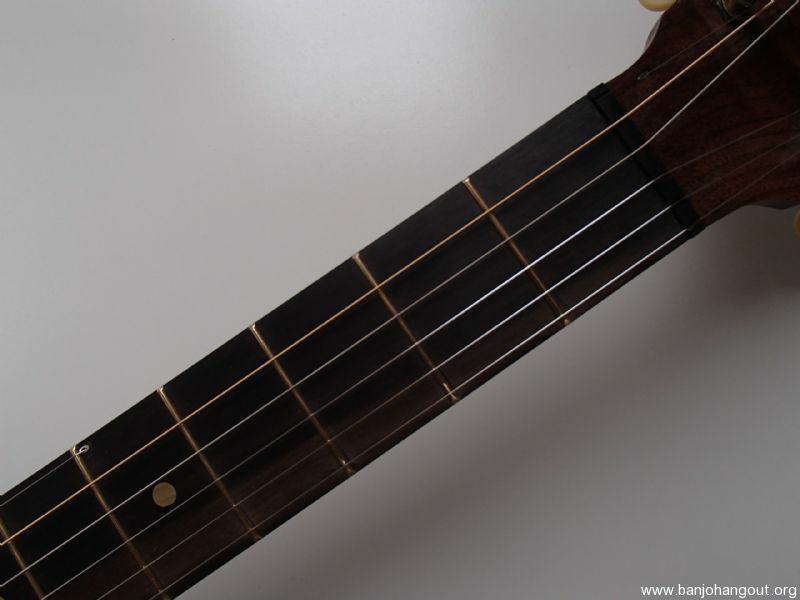 The high G string runs through a stainless steel tunnel from the 5th fret and emerges under the nut, through the peghead overlay. 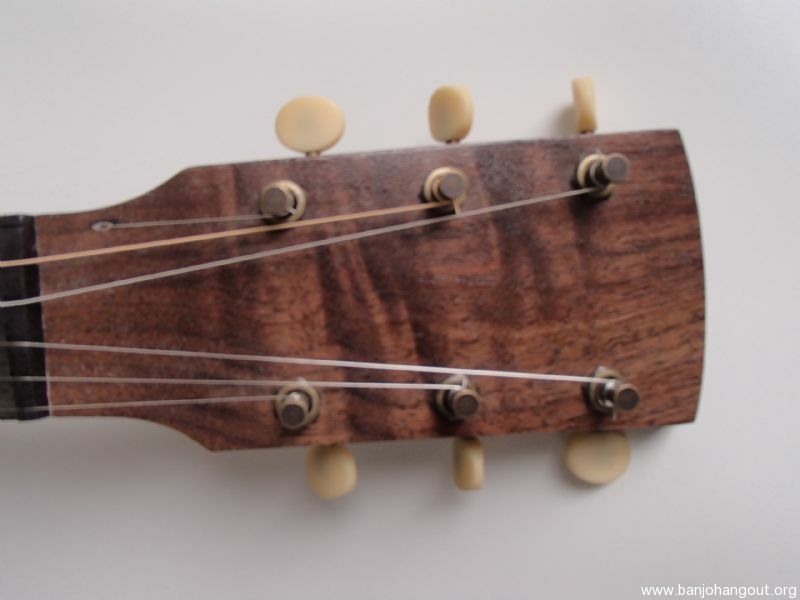 This string can be removed and replaced with a .046" string which runs over the nut in the usual way to tune EADGBE like a guitar. I wanted to make one originally to see if it would work, and it sat around for over a year before Steve Jones came to see it and bought it. He is a very skilled banjo player and has graciously offered to let me link to his videos he has made with #46 so that you can hear what this style of banjo can sound like in the hands of a real musician. 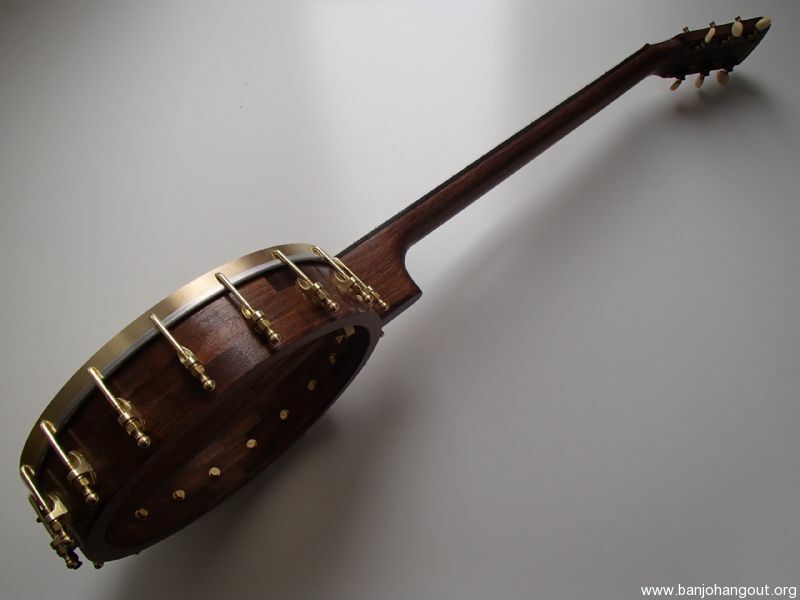 Banjo #102 is made from walnut with a 12" pot and 25.5" scale length. It has an ebony fretboard with a 12" radius and EVO fret wire. There is a two way truss rod in the neck which is accessed from the heel and the tuners are Golden Age from Stew-Mac in a relic brass finish. The pot has a dowel stick yoke and Van Eps style tension hoop which I made. 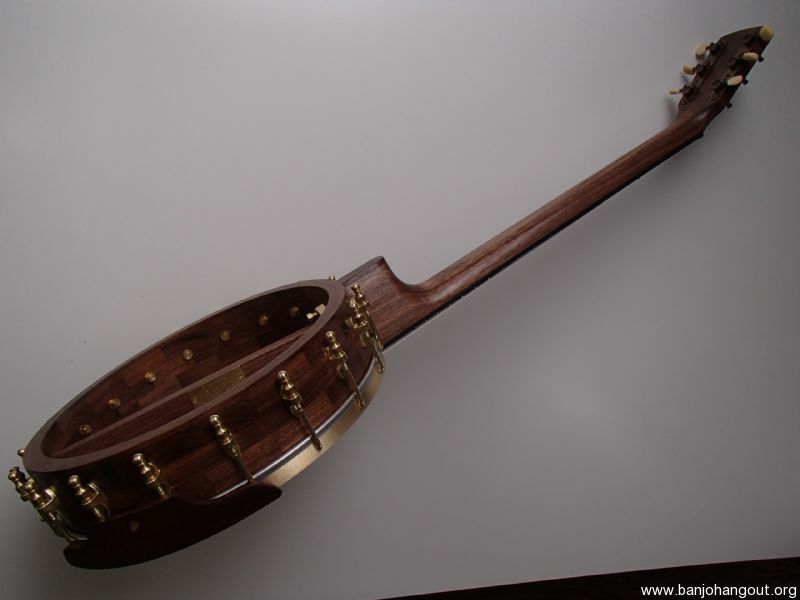 The shoes, hooks and nuts come from Balsam Banjo Works, the tailpiece comes from Rickard Banjos and the Renaissance head comes from Smakula Fretted Instruments. The Romero style armrest is optional, I will sell the banjo without it for $35 less. The nut is Corian and the banjo has a Tru Oil finish. 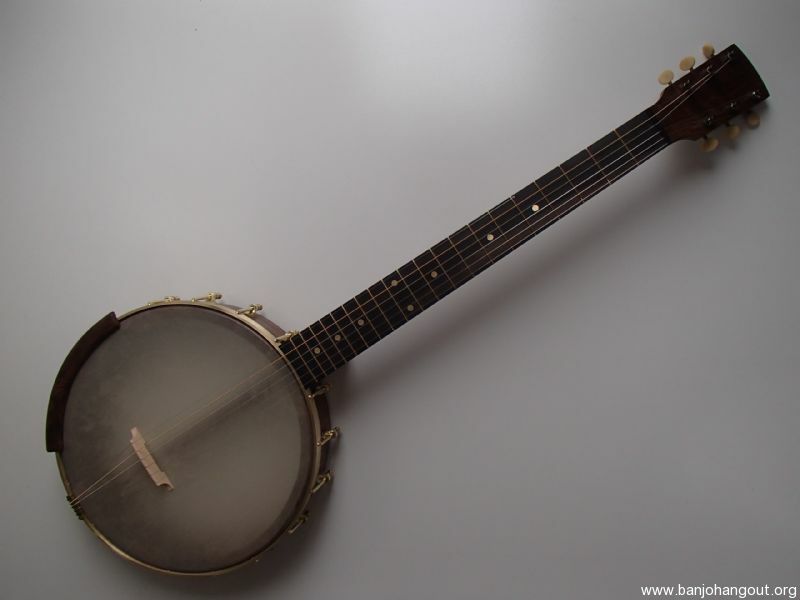 I will be happy to include a .046" string with the banjo if you’d like one, just let me know. I can add 5th string spikes for $5 each. 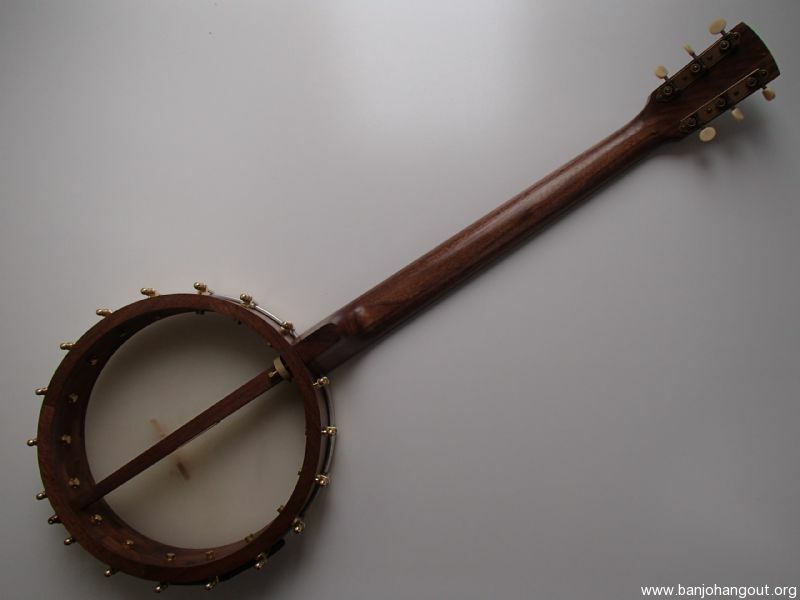 I will post links to a new video I tried to make of this banjo and an old video of #46 being played as a guitar-banjo.